The existence and successful survival of ‘democracy’ in such diverse conditions is the most celebrated fact about our country and constitution is its backbone. To reinforce the significance and importance of constitution the government of India declared 26th of November as Constitution Day. 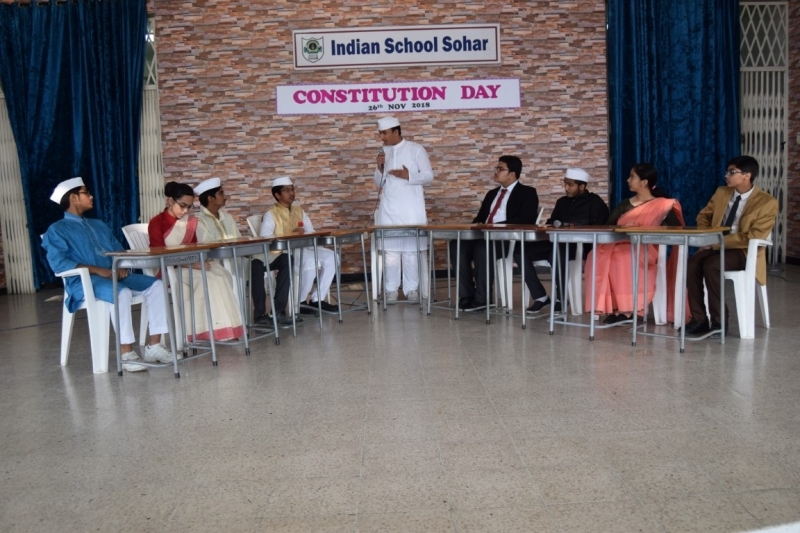 A special assembly was conducted by IX.F students to celebrate Constitution Day in Indian school Sohar on 26th November 2018.The assembly started with a prayer song, followed by the thought, news headlines and speech. A specially designed quiz was conducted to enhance the awareness of the students about the constitution. The most attractive part of the assembly was a patriotic song ‘we the people of India. To enhance the patriotism, a skit was performed which grabbed the attention of the audience. There was a lively performance by some of our students to show their unique talents (UTAR). The principal awarded certificates to the winners of Inter House English Debate Competition and participation certificates for the U N Model Assembly competition held at Al Wadi AL Kabir.The Principal, Ms.Sanchita Verma addressed the assembly and gave some valuable information about Indian constitution. The assembly concluded with the National Anthem.